Brief Synopsis – Biopic of Johnny Cash and June Carter through all the ups and downs of their music careers. My Take on it – I’m a big fan of music and before seeing this movie, I knew very little about Johnny Cash and June Carter. This movie has an excellent combination of great music, a very interesting story and above all amazing performances by both lead actors Joaquin Phoenix and Reese Witherspoon. Both of them were nominated for Oscars for their roles, but unfortunately only Witherspoon was able to go home with gold. Phoenix lost to Philip Seymour Hoffman who won the award for Capote (2005) which I think is somewhat of a travesty because Phoenix was so great here. 2005 in my eyes was a pretty weak year for movies and I truly believe that this movie was one of the best (if not THE BEST) movies to be made in 2005, regardless, it is my favorite. Their life stories are so captivating and it’s always interesting to see the ups and downs of famous people’s lives especially when done in an inspirational manner. I find this movie to be uplifting and recall that it helped me raise my spirits when I was rock bottom. 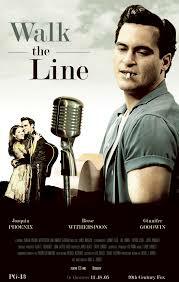 Bottom Line -Great music, great story and great performances all together make this my favorite movie of 2005. Unfortunately, only Witherspoon got an Oscar for it. Highly Recommended! This is probably my all-time favorite biopic. Phoenix is so great as Johnny Cash. Thanks Lindsey, it’s one of my favorites too! yep, hopefully he’ll get another chance at some point! Phoenix definitely deserved an award for his work here – though, admittedly, I haven’t seen PSH in Capote. Really like this film, and the music is wonderful. Great write-up Rob! Thanks Adam! totally agree with you here! Haven’t watched this one yet and I’m not sure I have an excuse. I need to check this one out already. Good review, Rob! cant wait to hear your thoughts on it Vic!